The event is skijoring, and if you’ve never heard of it you aren’t alone. 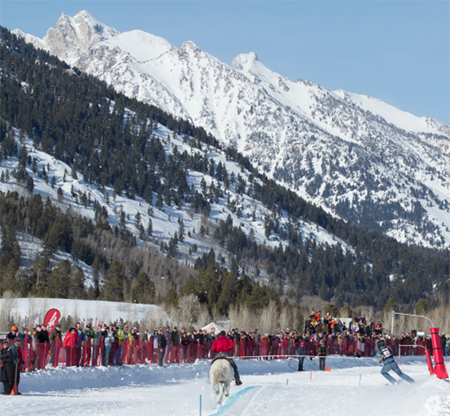 A team consists of a horse and two humans: one human takes the horse’s reins and the other one tows behind on skis, navigating a slalom course while also grabbing several rings along the way. If the skier misses a gate or a ring they receive a time penalty. Although the sport does not get much press, skijoring has been around for hundreds of years, originating in Scandinavia as a means to cross large snow-covered distances. It was even a demonstration sport in the 1928 Olympics. Here in Jackson the event served as a fixture to Jackson Hole’s 50th anniversary reunion weekend and a fundraiser for the local Shriner’s hospital. The Sunday final also served as a perfect outdoor pre-party for the Super Bowl, where even the contestants were partaking of a few beverages at the start gate. Although there was undoubtable talent in both the riders and skiers, the charity event didn’t take itself too seriously. 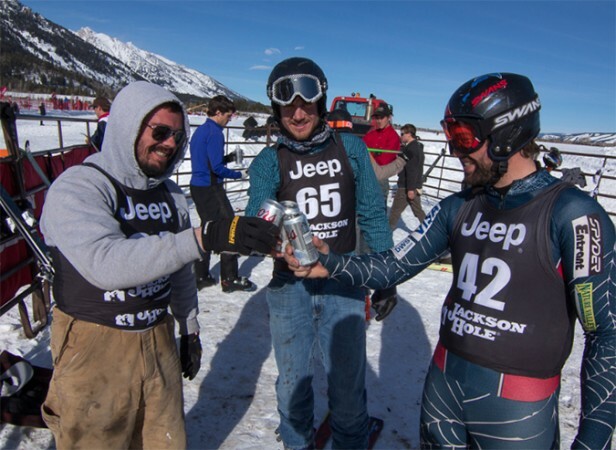 With team names such as “Pedro for President” (Pedro was the horse on the team) and “Will Ski Jour For Beer”, it did make money for good causes and the competition aspect was more of a peripheral part of a weekend where horse loving skiers come together, run a few time trials… and drink. In case you haven’t noticed, beer is a recurring theme here. When I asked racer Colin Cook what his favorite part of competing was, his response was “It’s a sporting event where you can drink.” His fourth place finished proved that perhaps beer can be a good performance enhancing supplement after all. But as much fun as the racers were having, the spectators on the sidelines were also entertained. Considerable amounts of alcohol certainly helped them cheer the racers on, with plenty of crowd-pleasing spills to keep the peanut gallery happy and shouting, their collecive volume ever increasing throughout the afternoon . Why this sport does not get more attention is beyond me. It’s probably because if you live outside the Rocky Mountain states there’s little access to the proper amount of space–and horses. But for this community of competitors the stoke was high, the competition fierce, and yes, the beer plentiful.